Sponsored: Creation Wines on the upper reaches of the Hemel-en-Aarde is delighted to have topped the Tonnellerie Saint Martin Pinot Noir Report compiled by Winemag.co.za once again, this time with the 2015 Creation Art of Pinot Noir which scored an impressive 93/100 in the 2018 report. The highly acclaimed wine is described by the panel as: “Rich but balanced with layers of flavour – dense fruit and racy acidity before a long, dry finish making for a sumptuous drinking experience.” Last year it was the 2015 Creation Reserve Pinot Noir that took the honours. To make Pinot Noir of such distinction requires a very special terroir. Jean-Claude (JC) and Carolyn Martin’s ‘little piece of paradise’ can be found on the undulating foothills of the towering Babylonstoren Mountain in the Walker Bay Wine Region. Here, close proximity to the Atlantic Ocean (only 9 km away) combines with an altitude of 240 m to 290 m above sea level. Most late afternoons during the growth period a glorious thermal vortex of ocean mists rises over the mountains, along the ridge and up Babylonstoren, creating a giant fan of whirling clouds. This is but one of Nature’s wonders contributing to a cool average temperature of between 23° and 26° C and a night index 12° C lower than at midday during the growth period. These cool maritime conditions are further enhanced by remarkable 450-million-year-old Bokkeveld shale, clay-loam soils which according to JC are ideal for the cultivation of Pinot Noir, contributing to the structure of the wine. While establishing his career in Switzerland JC, who is a qualified viticulturist as well as a winemaker, honed his skills on Pinot Noir and is therefore familiar with the challenges faced when cultivating what can be a fickle grape. Before planting his Pinot at Creation he meticulously considered aspect, soil and row direction and selected only virus-free clones (Dijon 115 and 777) for their suitability to the terroir. His Pinot vineyards are planted on southeasterly, easterly and northeasterly slopes with each site expressing itself in its own stylistic way. “The grapes for our site-specific Art of Creation Pinot Noir are selected from a small gem of a pocket, within a single vineyard block. The wine is 30% whole-bunch fermented to capture the freshness of the cool-climate grapes. In the case of the 2015 vintage, a barrel selection of only 3 050 bottles were released under the Art label,” JC explains. 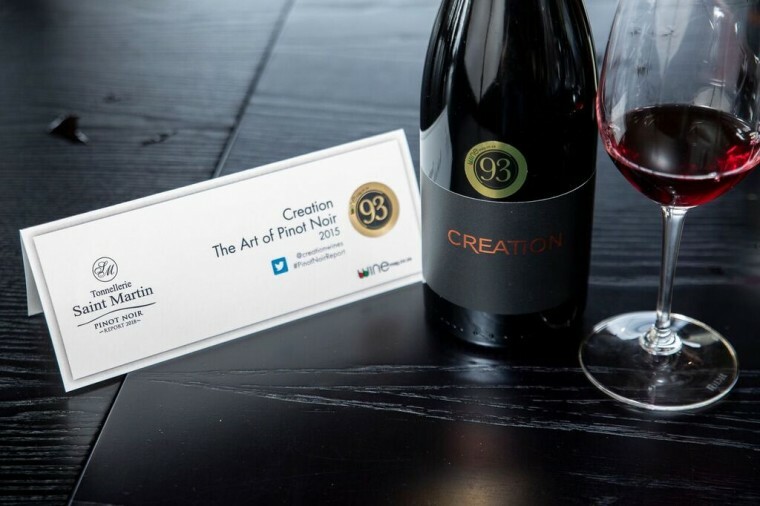 Apart from excelling in the 2018 Winemag.co.za report, the Creation Art of Pinot Noir has received accolade upon accolade ever since its maiden vintage in 2013. Among the latest has been a coveted 5-star rating for the 2016 vintage in the 2018 Platter’s South African Wine Guide, and a gold medal and 95/100 score at the 2018 Decanter World Wine Awards (DWWA). Authoritative wine critics such as Tim Atkin, Neal Martin and Greg Sherwood have also repeatedly scored the wine an impressive 93+ points. A feast of a wine indeed. And with the Festive Season approaching, it is good to know that individually numbered, beautifully packaged in a wooden box and personally signed by Cellarmaster JC Martin, a bottle of the Creation Art of Pinot Noir presents a truly exceptional gift. Apart from the Art of Pinot Noir, there are three other award-winning Pinots in the Creation portfolio: Emma’s Pinot Noir, the Reserve Pinot Noir and the Estate Pinot Noir. The Creation range further comprises six whites and five reds, all renowned for their elegance and finesse and all eloquently expressing the unique Hemel-en-Aarde Ridge terroir. Thanks to refreshing natural acidity, complexity, superb balance of fruit and tannins and the judicious use of oak these wines are eminently food friendly. Small wonder therefore that pairing guru Carolyn Martin and the Creation Culinary Team enjoy such an enviable reputation for wine and food pairing. The ever-evolving pairings offered in the Creation Tasting Room presently include seven delectable options, with the most recent addition the ‘Spring Story of Creation’ – a truly memorable taste adventure featuring six scrumptious courses or ‘chapters’, artfully paired with seven award-winning Creation wines. This Festive Season, why not treat family and friends to a tastefully packaged gift from the Creation selection? Or better still, visit the scenic estate where the Creation Culinary Team looks forward to welcoming you with a feast of flavour. Visit www.creationwines.com for details.